Vegans tend to be thinner than meat eaters, but a few tweaks to your diet can help you add extra pounds to your frame. While you can gain weight through food alone, a vegan weight-gain supplement serves as any easy source of calories if you fill up too quickly or have a hard time eating regularly. Talk to your doctor or dietitian about your weight and vegan diet plan to help you determine what supplement, if any, fits your needs. No matter what you eat or don't eat, the key to adding weight is to shift your caloric intake so that you're eating more calories than your body burns. Eating an extra 250 to 500 calories a day may help you gain 1/2 to 1 pound a week. However, depending on your genetic makeup and level of physical activity, you may need to add even more calories to gain the weight you want. A vegan supplement may be able to add those extra calories without requiring you to make any other changes to your usual diet. The vitamin store GNC offers a number of store-brand products, including the animal-free Puredge Complete Vegan Gainer. This supplement contains 140 calories, 17.5 grams of carbs, 12.5 grams of protein and 2.5 grams of fat per scoop. The protein comes from a plant blend of flaxseed powder, pea protein isolate, brown rice protein concentrate, quinoa powder and chia seed meal. The quinoa and chia seeds, along with oat bran, amaranth, buckwheat and millet, are also good sources of fiber, contributing 2.5 grams per scoop. The product's fat comes from a blend of seed oils, and it's sweetened with monk fruit and stevia extracts. GNC Puredge Complete Vegan Gainer is available in chocolate or vanilla flavor, and you can mix it with water or with a plant-based milk alternative for bonus calories. Vega One All-In-One nutritional shake isn't marketed as a weight gainer, but this powdered vegan formula is higher in calories and protein than the GNC Puredge product. One scoop of the mix contains 170 calories, 13 grams of carbs, 20 grams of protein and 6 grams of fat. Pea protein is the first ingredient and the primary source of protein, followed by flaxseed, in this high-calorie supplement. Organic broccoli, kale and spirulina up the fiber content, with 7 grams per scoop, and help you avoid any unwanted pesticides as well. These veggies, along with the fruit blend that's added to the powder, act as a natural source of vitamins and minerals, providing 50 percent or more of the daily value for vitamins A, D, E and K, in addition to a number of the B vitamins. The product label also lists probiotics and stevia as ingredients. Flavor options for Vega One All-In-One include chocolate, French vanilla and vanilla chai. True Solution nutritional shake is not specifically marketed as a weight gainer but is a high-calorie nutritional supplement that's free of animal products. And it's ready to drink, so there's no need to mix. One 11-ounce container supplies 270 calories, 31 to 32 grams of carbs, 5 grams of fiber, 17 grams of protein and 9 to 10 grams of fat. 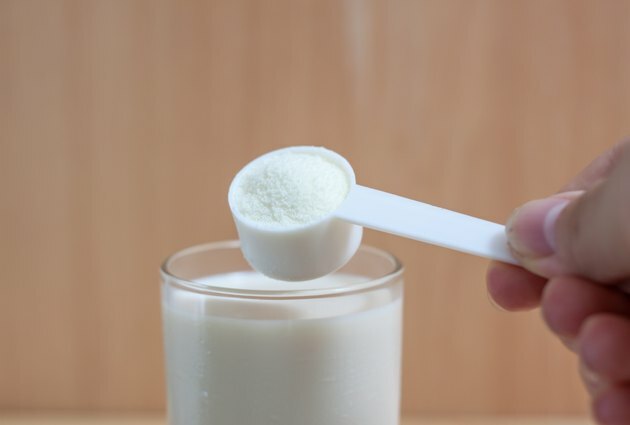 Pea protein provides much of the protein in the drink, which contains added sugar and stevia extract, as well as carrageenan and natural flavors. The source of its fiber is inulin -- also called chicory root fiber -- an added fiber found in a number of processed high-fiber foods such as cereal and energy bars. This shake is fortified with vitamins and minerals, so if you're drinking it, you may want to consult your doctor about taking any additional vitamin or mineral supplements to ensure you're not getting too much of any of these micronutrients. Flavor options include vanilla and chocolate. Vegan weight-gain supplements may be convenient, but they can be costly. Create your own high-calorie weight-gain drink to keep more of your money and more control over the ingredients. Blend together 1 cup of soy milk with 1 cup of cubed mango, a large banana and 2 tablespoons of tahini for 540 calories and 14 grams of protein. Or try 1 cup of pineapple juice blended with 1 cup of soft tofu, two kiwis, 1 cup of sliced strawberries and 1 tablespoon of flaxseed oil for 520 calories and 14 grams of protein. U.S. News &amp; World Report: What Is Inulin (Chicory Root Fiber)?